Happening now, the Coca-Cola Orlando Eye is set to become the home of Halloween and the spookiest sight in all of Central Florida transforming into a 400-foot tall spider web with giant creepy-crawlies, an all-new light and music show, themed Snapchat filter and more family fun as part of “Spooky Nights and Spider Frights”, Friday, October 13th to Saturday, November 4th. 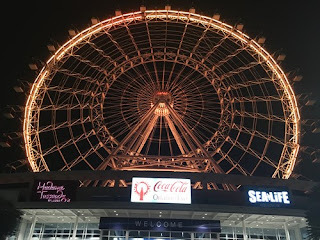 From the I-Drive 360 courtyard, guests can also experience the witching hour as 64,000 LED lights bring the tallest observational wheel on the United States East Coast to life in a kaleidoscopic ten-minute show synchronized to an iconic Halloween soundtrack that is sure to have everyone dancing. The light show will run Sunday-Thursday 8pm and Fri-Sat at 8pm and 10pm. Goblins and ghouls of all ages will be able to take in the sights while 400 feet in the air in one of four spooky Halloween-themed capsules. Experience unique views of Orlando surrounded by sneaky spiders, petrified pumpkins, ghoulish ghosts or frightening fall decorations.